Today was in the top ten of beautiful days to ride. Perfect temperature. Perfect weather. Perfect road conditions. San Dimas, California (November 26, 2013) – The Southern California Velo Cycling Club (SC Velo) and Incycle Bicycle Stores are sponsoring a Christmas Toy Collection drive beginning on Saturday November 30th and concluding on Saturday December 14th. A Toy Ride will be held on Sunday December 15th to take the collected toys to the San Dimas Sheriff’s station so that they can be distributed to needy families. 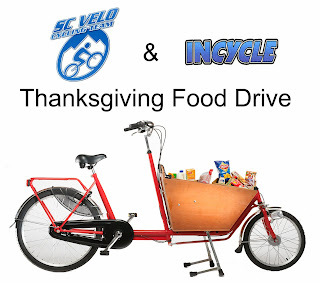 All interested cyclists are invited to join with SC Velo riders to support this worthy cause by donating toys and/or participating in the ride. Unwrapped toys can be left in collection bins at Incycle Bicycle Stores in San Dimas, Chino, Pasadena, and Rancho Cucamonga ( see: http://incycle.com ) between November 30th and December 14th. Everyone donating toys to the Toy Drive will receive an Incycle water bottle in appreciation for their donation. Incyle’s San Dimas store will be hosting a Bike Swap Meet during the Toy Drive collection period. The Bike Swap Meet will be held on Saturday December 14th. For more information see the Incycle web site ( http://Incycle.com ). Come on out to participate in this event and bring along some toys for the Toy Drive with you. 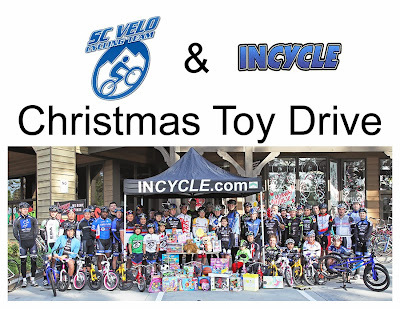 The SC Velo Toy Ride will depart from the San Dimas Incycle store on December 15th at about 9:00 AM for an easy, no-drop, 1 hour+ ride with SAG support to the San Dimas Sheriff’s Station to turn the collected toys over to Los Angeles County Sheriff’s Department representatives. Bill got out on the road today. 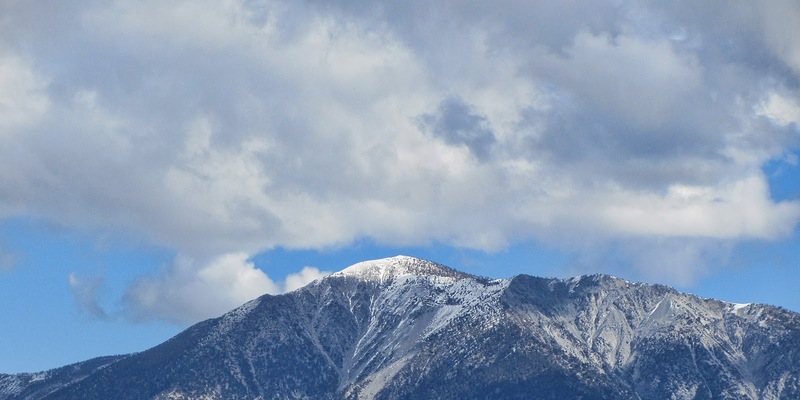 The view of Baldy was spectacular. 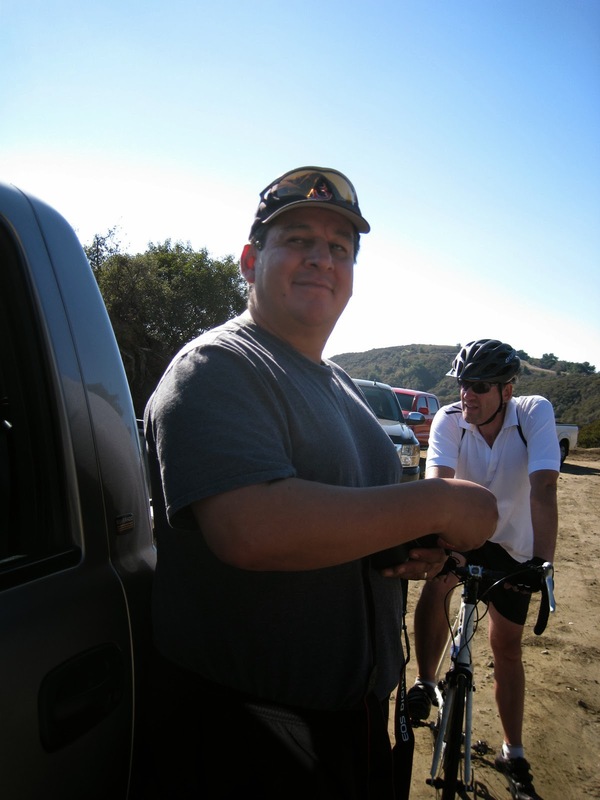 He saw forest service trucks hanging out near mile marker 12.57 to assist with the OTS Vehicle. John and I started late on Sunday morning around 10:30 am. Enjoying the warmer temperatures of the day. Enjoying the sun and the blue sky. We were pleasantly surprised when the roadside photographer snapped our photos and chuckled with a familiar voice, It was none other than the world famous and GMR champion, Mr. Beanz. 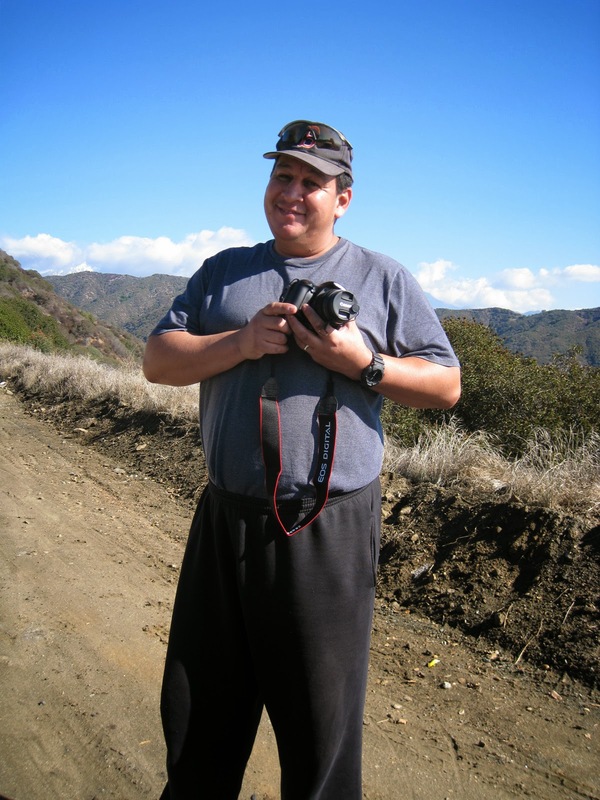 John and I became test subjects as Mr. Beanz clicked and videoed us with multiple cameras. "Are you training for something, GMR?" Beanz asked. I chuckled. Those stunning out of the saddle shots can look awesome. It has been a week since I pedalled. It was a good ride with my thumb bundled in gauze from the Saturday morning incident when a snowman bit my thumb. One ER trip and three stitches later, my thumb is holding me together. A week ago, I saw this young cyclist paced with his own moto support. He sped along with out breathing hard. Saturday had a 20 percent chance of rain. On Friday morning it was a late morning decision to go for a short ride. Great decision. It was dry. Clouds overhead. Just a bit of a chill on the way down. 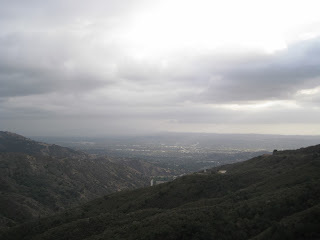 Saturday morning was damp, drizzly and the clouds shrouded the ridge line from view. I hemmed and hawed while John C. like a trooper rode to the shed. What a man. I ate chili for lunch. Snoozed and then saw the sun was out. Ride! Got out about 1:15 pm. Best time of the day. The road had dried. Very light traffic. Met Duane and Steve riding up GMR to ride down the Monroe Truck Trail. Two short but well needed rides. Relieve stress. Recover the knee. Have some sun. 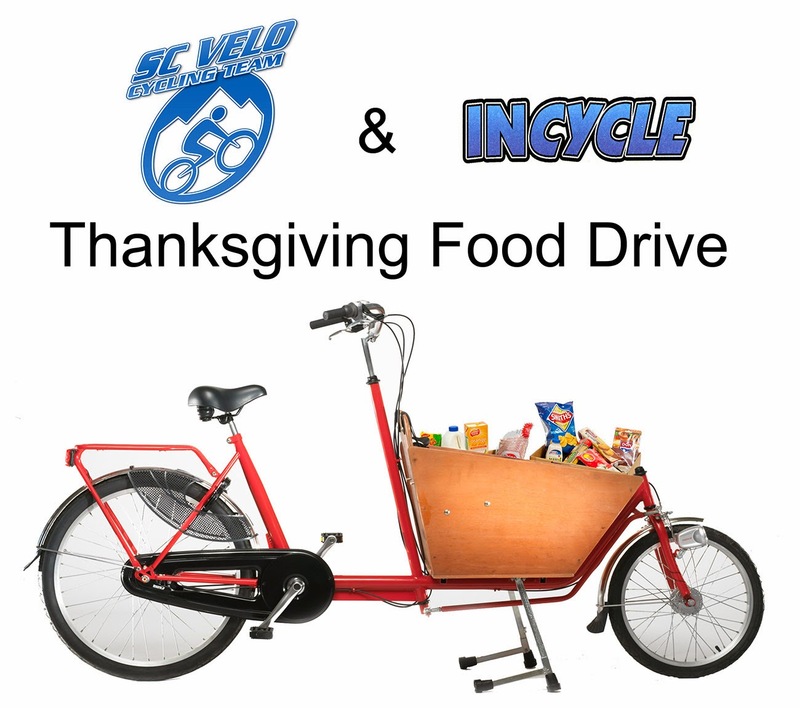 San Dimas, California (November 13, 2013) – The Southern California Velo Cycling Club (SC Velo) and Incycle Bicycle Stores are conducting a Thanksgiving Food Collection Drive to help provide holiday dinners to families and individuals that otherwise could not afford one. 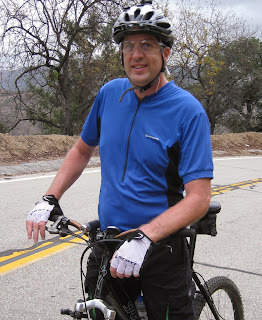 After a a trip to Oak Glen for apples and pie on Friday, this necessitated a longer ride on Saturday. I rode to the shed with Eli as Bill and John followed in close pursuit. Matt and John his coworker took an alternate route and rode up Highway 39, East Fork and the backside of GMR for the "Loop". The day was warm not hot and cool not cold. 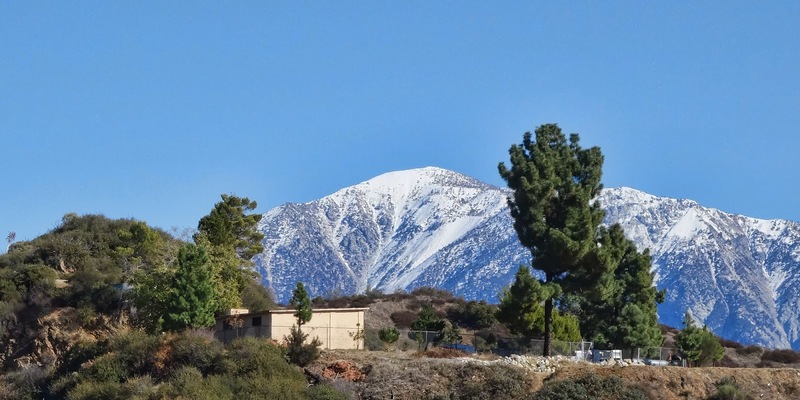 Although the stretch of Glendora Ridge Road shrouded in shade by the hillside and the southern sun chilled and whispered of the pending colder weather. The jacket and knee warmers I had last week would have been used this week.I must have burned a few more calories shivering, right? 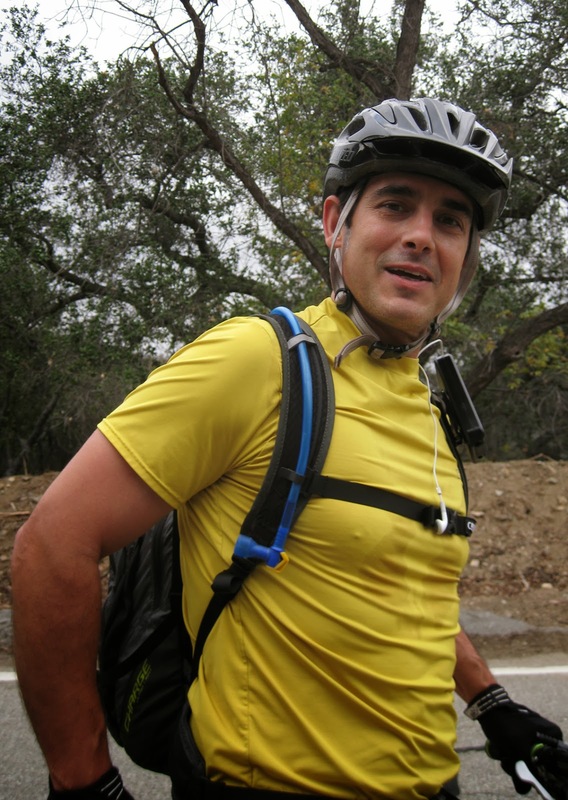 Most rides were uneventful, pedaling, meeting people, snacking and then more pedaling. The mountain provided relief from the cares of the city and work. I shook off faint premonitions and rubbed the back of my neck at the beginning of the ride. Eli talked of his entrepreneurial pursuits and the hope that more women cyclists would ride up Glendora Mountain Road. (Hint Eli, I saw a group of 7-8 women on Sunday). Eli sprinted on the downhill past mile marker 7 and I pushed hard to catch him before the 8% rise topped out. Eli surged ahead at the shed, while I waited for John to catch up. Bill lingered walking out a cramp at Newman's. At the shed, a pair of cyclists quizzed me about a female rider in a blue jersey. Yes, she was stretching before the first saddle, that was 30 minutes ago. The color of her white shoes as she reached for a hamstring stretch blazed in my brain. The three of us watched three more cyclists approaching. Carla and John were identified. Carla's two friends measuring their time and performance on Strava rode on. She was happy not to have the pressure to keep up. I told her it was "detached contact". She laughed. She explained her philosophy of cycling was to burn a few calories in order to drink beer. John happily asked where have you been all of his life? He's available by the way, Carla. The ride up the reward climb was just a bit easier this week. 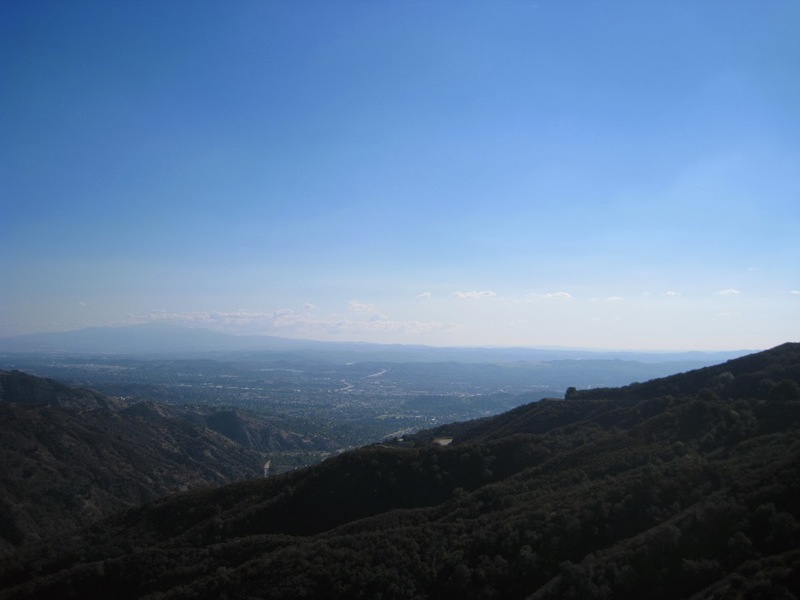 The altitude and previous miles pumped the heart. Until the relief of the downhill at GRR 8.3. The next four miles of rolling road, pine and deciduous trees with brightly colored orange, red leaves had all fallen to the ground. The rolling up and down to Cow Canyon Saddle was going along smoothly until John warned me of the rocks tumbling down the hillside at GRR mile marker 10.2. Big ones. I darted across the road to avoid the mini-avalanche. Small critters or old age had loosen the chunks and gravity did the rest. We dropped into the village and stopped at the small store with vending machines filled with drinks. A powerade had my name on it. A trio of cyclists stopped to eat lunch at the Lodge. They were seated on the patio above the store. The lure of real food spoke to my mouth and my gut. John had a peanut butter and jelly sandwich. that looked good as well. I chowed down a Cliff Peanut bar. The powerade was tingly cold on my tongue a few swigs then I filled up the water bottles with powerade. A quick trip up the street to the visitor center. John thought it was toasty warm inside the center and he checked out the King snake in an aquarium too small for its occupant. Back outside, an older hiker in a quilted blue jacket struck up a conversation and tested John's hockey fitness by kicking his shins. Stopped at the Post Office and the ceptic tank cleaner was pumping away. A few pictures and we were on our way. The climb out was just as hard as ever. What's this uphill thing? Why do I have to pedal? the legs were questioning my resolve. With the hardest climb done, I poured on the speed through the apline rolling section. It was good to start the descent from mile marker 8.3. 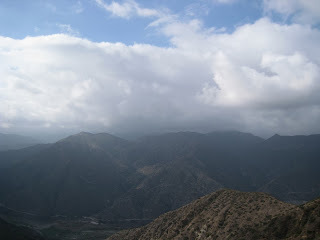 Down the reward climb, GRR had twisty tight curves, blind from a visual and auditory sense. You can't see around the bends and the mountain side absorbs the noise. The road was still in shade so no hint or gleams from shiny car parts. The road was narrow with no center stripe. I kept reasonably tight distance to my white line, but as I rounded a blind curve. 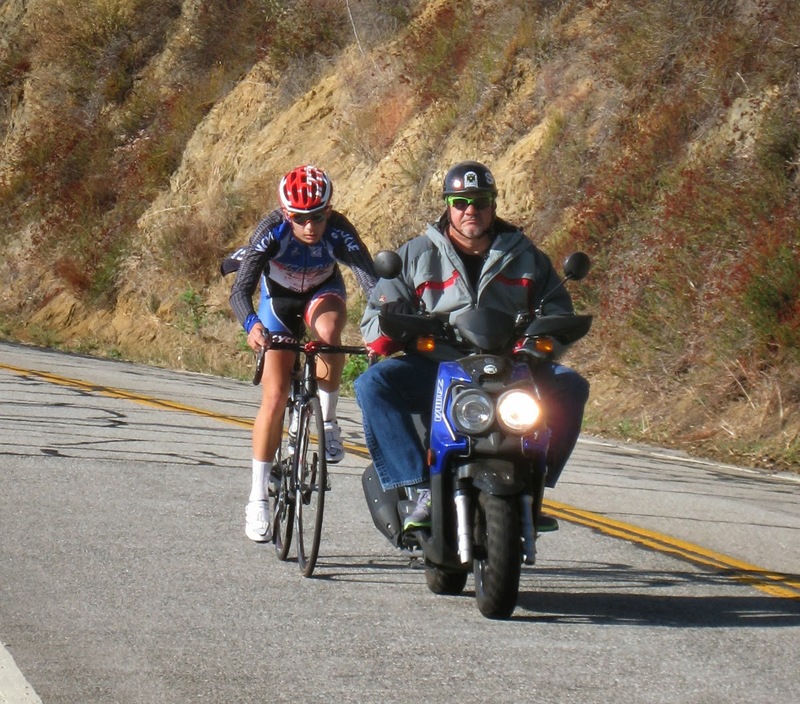 I saw two cyclists in single file headed uphill with two cars gunning past them on my side of the road. there was no room. I stomped on my brakes. My back tire fish tailed to the left and put my bike more in harm's way. I released my grip on the brakes. One option was a face plant on the white hood of the first car. the other option was to take a plunge over the side. There was only reaction, there was very little thinking time. I steered up onto the asphalt berm lined thick with dry, brittle weeds. I was still upright and moving. The cars passed. The weeds had high potential for stickers. I negotiated back onto the road. Still upright. The drivers were white knuckling it, they didn't bother to stop. I coasted to a turn out. The heart rate was pumping. I was in one piece. John amazed at the what just happened with his front row seat. Great bike handling skills. Your rims are awesome. Not even a pinch flat. I checked out the tires for stickers. I felt none. Breath in. I am still in one piece. Breath out. No ambulance ride. Yipee. A young fellow with an Iowa Jersey had stopped nursing his bum knee. His tale distracted my mind. He could not appreciate the feat I had just pulled off. After a recovery period, John and I restarted the descent. The trio from the Lodge breezed past us. Every blind curve I approached with caution. It was good to put the hard climbs past us and in the cool of the shade in the shed. It had warmed up on the way home, by mile marker 4. At the shed, a surprise meet up with Ron. We chatted about broken collar bones, steel plates and airports. John and I headed out from the shed. The wind was blowing warm and dry. With the gusts on the Glendora Mountain Road, I rode in the middle of the lane. GMR was a wider road and a delineated yellow center line. The last bit of hill near mile marker 7 has a blind curve and true to the day two more drivers speeding around the bend. Their tires squealed with a high pitched frenzy to match the white knuckles as the need to keep in their lane more imperative. Another "grey poupon" moment. Where my yellow jersey could have been mustard on the road. The mountain gods were testing my resolve on Saturday. My descending mojo broken, I took it slower than normal and thankfully squirrels stayed out of my way. Road Rage incident in the city, a police car blaring its siren. I was finally at home. As time passed the event seemed inconsequential to those who hear my tale. In that instant of facing down a charging car with outcomes equally likely to result in ambulance rides, broken bones and medical bills, I am thankful to being upright and well.